START BONSAI Professionals offer lessons on bonsai -- the basics, daily care, the fundamentals of appreciating bonsai, etc. Haruo Kawakita, the second generation of Shoyuen bonsai garden in Takamatsu's Kokubunji town, belongs to Kagawa Kokufu branch of All Japan Shohin Bonsai Association. He cultivates many shohin, especially Kuromatsu. Spring is the best season for transplanting. So he does the work from March to the end of April every year. The process of transplant of shohin is same as that of large bonsai. It is good to do once in every 3 or 4 years when the roots are intricated and the soils get entangled and become ill drained. Compared with large bonsai, shohin is sensitive and needs to be careful of trunk for transplant. 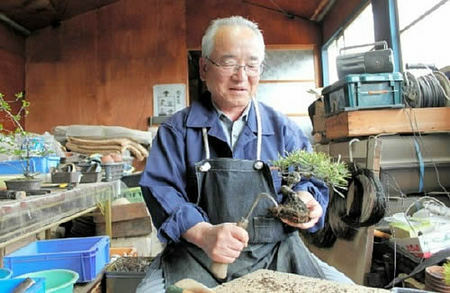 He transplanted a shohin Kuromatsu about 10 years old. The tree has been cultivated in a pot so it is thin but has the old atmosphere on the surface of trunk. First, soak a whole tree in water to pull it out from a pot. Next, remove almost all the old soils. Then take away the long thick and black rotten roots. If Nebari roots are overlapped each other, cut the unnecessary one. After that, arrange the shape by scissors and transplant to a new pot. Kawakita makes pots by himself. For this, he chose a brown ellipse pot with a consideration for the tone of Kuromatsu. Then, put sands about 4 or 5 millimeters in the bottom of the pot for good drainage and put the mixed soils of small sands and Akadama soil. It is effective to add crushed charcoal for preventing the root rot. Heap the soils up in the middle and plant a tree to press the roots. Next, with the attention to the balance, fix and stabilize it with wire to protect from wind. For the spot between the tree and pot, thrust soils by skewer. Push the soils by trowel to make hard. It helps to avoid them running out from the pot in watering. After transplant, wash dust away by water in a bucket. When the tree is shown in an exhibition, he adds the decorative moss. Kawakita says, "I like Shohin because it is easy to carry and I can take care in everywhere. In addition, there are many ways to display. The trees are small but they can make the great taste like large bonsai."